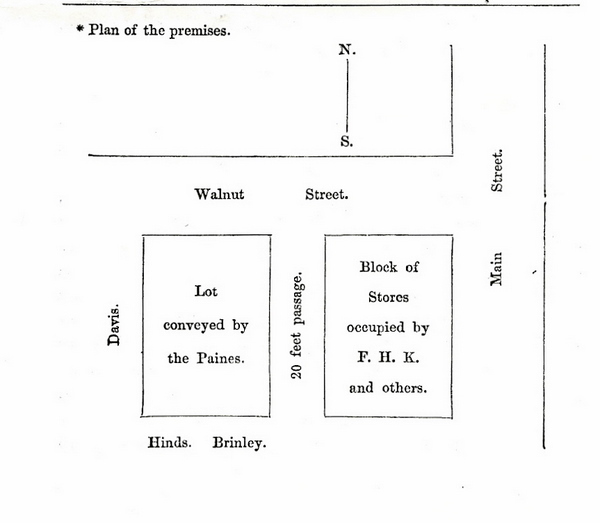 Where the owner of a block of stores, and of land adjoining thereto, made a conveyance of a part of the latter, parallel with and at the distance of twenty feet from the former, "together with the right of passing and repassing over the space of twenty feet between the west wall of the store aforesaid and the eastern line of the before granted premises;" it was held, that these terms were descriptive of the land, in, through, and over which, the grantee was entitled to a right of way, but did not describe the limits of the way granted; and that the grantee was thereby entitled to a convenient way, within the land so specified, adapted to the convenient use and enjoyment of the land granted, for any useful and proper purpose, for which it might be used. The plaintiff has ever since continued to be, and now is, the owner of the estate conveyed to him by this deed. The defendants, at the time of the conveyance, were and ever since have continued to be the occupants of one of the stores in the brick block. being the store named in the deed as "occupied by F. H. Kinnicutt;" and during the whole time of such occupation, they have at all times kept boxes, barrels, &c., piled up against the rear of the store, and within and upon the space of twenty feet between the store and the plaintiff's estate. whole of it kept open and unmolested at all times, then judgment is to be entered for the plaintiff for the sum of twentyfive dollars damage; but if the court should be of opinion, that such is not the true construction of the deed, but that it merely conveys to the plaintiff a convenient right of passage way, of reasonable and convenient width, over the said space of twenty feet; or that the right conveyed by the deed is other than that of a passage way as wide as the whole of the space of twenty feet; then this statement of facts is to be discharged, and the case to be submitted to a jury, under such directions, as the court shall determine the true construction of the deed requires. P. C. Bacon, (with whom was I. M. Barton,) for the plaintiff, argued, that, from the terms of the deed, the manifest intention of the parties, and the facts agreed, the plaintiff was entitled to an absolute right of passing and repassing [**4] over and using the whole of the space of twenty feet, described in the deed, as a passage way; and, consequently, that he had a right to have the whole width thereof kept open and unencumbered for his use. Salisbury v. Andrews, 19 Pick. 250 ; Underwood v. Carney, 1 Cush. 285 . J. C. B. Davis, (with whom was H. Chapin,) for the defendants. made. Choate v. Burnham, 9 Pick. 274 ; Salisbury v. Andrews, 19 Pick. 250 . 2. If the plaintiff is entitled only to a convenient right of way, then the defendants may use the land in any manner consistent with such right. Atkins v. Bordman, 20 Pick. 291 ; Atkins v. Bordman, 2 Met. 457 ; Chandler v. Goodrich, 9 Shepl. 78; Jackson v. Allen, 3 Cow. 220; Senhouse v. Christian, 1 T. R. 560. SHAW, C.J. This action is case for the obstruction of a private right of way, over a space twenty feet wide, and about one hundred and eight feet long, running back from a public highway, and adjoining the plaintiff's land. The plaintiff claims title under a deed from Charles Paine and Henry Paine to himself. It is conceded, that these grantors owned in fee the block of stores on Main Street, in Worcester, a part of which is now occupied by the defendants, together with the land immediately back of the stores, and extending back westerly, so as to include the land conveyed to the plaintiff. On the 18th of July, 1843, Charles and Henry Paine, then being the owners thereof, conveyed a tract described as bounded easterly by a line twenty feet distant from the block of stores, and parallel thereto, to hold in fee, -- there being a space twenty feet wide between the land conveyed and the block of stores, -- "together with the right of passing and repassing over the space of twenty feet between the west wall of the store aforesaid and the eastern line of the before granted premises." The land thus conveyed being bounded on one side on Walnut Street, which is a public highway, the private way granted by the deed communicates with Walnut Street, and runs the whole length of the lot conveyed. contrary, the plaintiff claims, that he is entitled to an unobstructed use of the whole space between the parallel lines, for a way; and that any obstruction therein, to prevent such a use, is a disturbance of the right granted him by the deed. This question must depend entirely upon a just construction of the terms of the grant. The grantors owned both estates in fee, and they might grant a more or less restricted right, by way of covenant, as they should think proper. The terms of their deed, delivered by the grantors, as their act, and accepted by the grantees, must be considered as the evidence of their agreement, and the measure of the right granted and acquired by it. Upon this question, the court are of opinion, that the words in the grant, "the space of twenty feet between" &c., describe the close, in, through, and over which, the plaintiff should have a right of way; but that they do not describe the limits of the way granted. It was therefore the grant of a convenient way, within those limits, adapted to the convenient use and enjoyment of the land granted, for any useful and proper purpose, for which the land might be used, considering its relative position, in reference to Walnut Street, on which it bounded, -- to Main Street, -- to its location in reference to other parts of the town, -- and other like circumstances. If it was well adapted to the erection of dwelling-houses or workshops, or a barn, or for the purposes of a garden, or the like, then the presumption of law is, that either or all such uses were contemplated, and the right of way would extend to the use of it, for foot passage, for horses, cattle, teams, wagons, or otherwise, as the convenient use of the land, for any such purpose, would require. and convenient right of way. It does not therefore necessarily follow, because a portion of this space was covered, that the plaintiff was thereby impeded in the use of a convenient way; it may or may not be so, and this depends on facts, which must first be inquired into and settled by a jury, unless the case should be otherwise disposed of by the parties. According to the agreement, the statement of facts is to be discharged, and the case stand for trial.